December 20, 2016 By Editor & filed under Blog, Success Stories. Success: 16 pounds lost so far! Earlier this year I had to have surgery for varicose veins. The extra weight on my body wasn’t good for me. That was my wake up call. Initially I couldn’t work out. But slowly I was walking and using my treadmill to get some workouts in. Mother’s Day 2016 I decided it was time to take things a bit more seriously. I started reading articles on Get Healthy U and I started incorporating some of the info into my workouts and my eating habits. Then I signed up for Get Healthy U TV and started working out 150 minutes a week. The Total Body HIIT workout motivated me by showing me that I’m stronger than I thought I was! I now have the energy to hike, walk, and even run!! I didn’t take measurements before I lost the weight. But I dropped a pant size and all my clothes are way too big. I can’t believe it! For those of you who think it isn’t possible, YES IT IS! 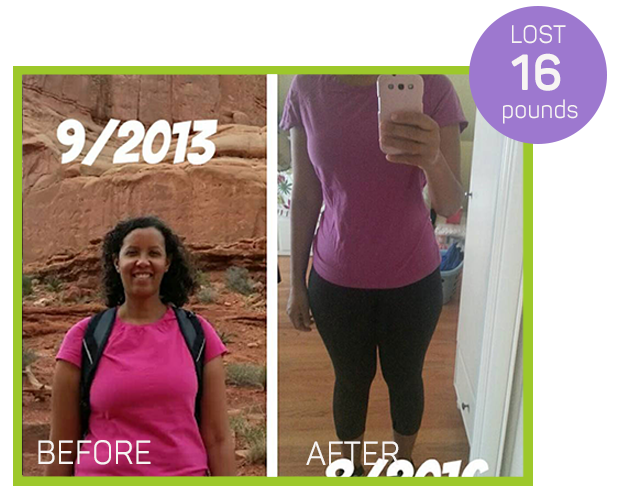 Trust me, if the queen of cookies and junk food did it, you can too! Total Body HIITwith Chris Freytag. It’s only 30 minutes long so I can fit it into my schedule, but it’s definitely a good workout! Chris Freytag’s constant motivation! The workouts are versatile and Chris always has modifications. Thank U Chris!! A big thank you to Ruth for sharing your story with us. Keep up the wonderful work! YES U CAN! Congrats on your amazing results. I am happy to get started on my ghtv journey.